Institutional economics is recognised as a peculiarly American development in economics — nothing quite like it emerged in Britain or continental Europe. As such, a knowledge of the literature of institutionalism is a necessary part of understanding the history of American economics and American social thought more broadly. 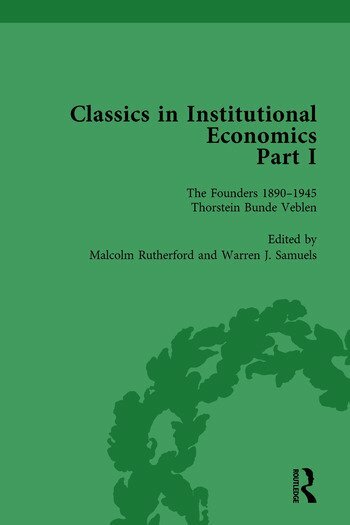 The work of the authors featured in this collection served to create and define the American institutionalist tradition in economics: Thorstein Veblen, Richard Theodore Ely, John Rogers Commons, Robert Franklin Hoxie, Wesley Clair Mitchell and Walton Hale Hamilton. These figures were also central to institutionalism’s numerous debates on the unifying characteristics of the movement and its principal contributions — making this collection of their most important works a convenient vehicle to assess these issues. It is also of increasing value given the fact that the main concerns of institutionalists, such as the role of institutions and development of an evolutionary approach, having been coming back into prominence as important issues in economics.